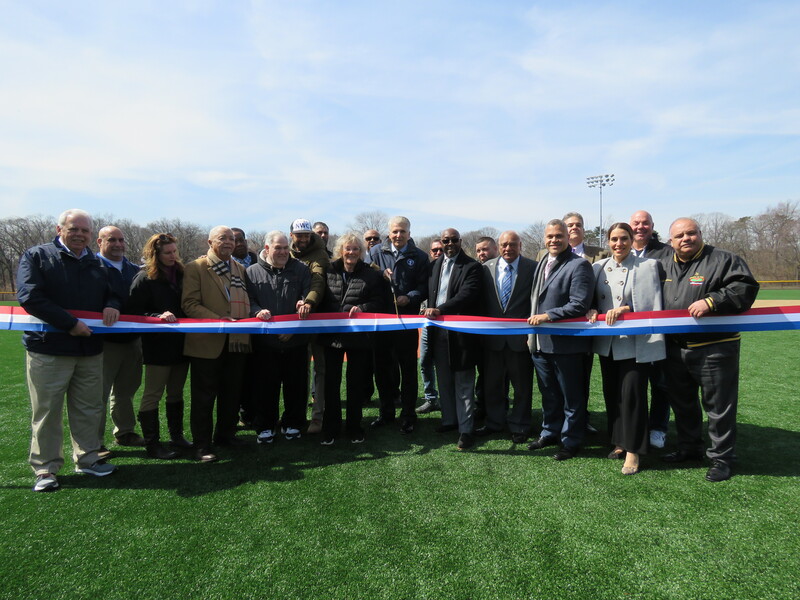 Newark, NJ – Essex County Executive Joseph N. DiVincenzo, Jr. announced on Wednesday, March 27th that work to modernize the Roberto Clemente Field in the Essex County Branch Brook Park Middle Division has been completed. The installation of a new synthetic grass playing surface is part of the County Executive’s ongoing initiative to ensure recreation facilities are up to date and meet the needs of the community. “High school and youth recreation programs hold their games and practices on our fields, so it’s important that our facilities are up to date. It’s important that we continually update our athletic facilities and fields so our children have modern and safe places to play,” DiVincenzo said. “We first installed a synthetic grass surface on the Clemente Field in 2005 and it’s been a great investment. The synthetic surface allows more teams to play here without the natural grass and dirt getting worn down and provides better drainage so the field can be used sooner after inclement weather,” he added. The upgrades were welcomed by members of the community and other local officials. “We see right here one of the best investments to save our children’s lives. Recreation helps save lives, and because of the collaborations between government and the community, you can see the dividends in Branch Brook Park and other County locations,” NJ State Senator and Deputy Chief of Staff Teresa Ruiz said. “This is another outstanding job to make sure our young folks have upscale places to play,” Freeholder Vice President Wayne Richardson said. “I am very proud of the work that Joe DiVincenzo has done to improve our parks with the Board’s support,” Freeholder Patricia Sebold said. “We are very fortunate to have over 1,500 children participate in Little League baseball here in Branch Brook Park, and it’s due in part because of the ongoing investment by the County Executive to continually update recreation facilities and the partnerships with community organizations. When you see how great the parks look, you understand this is an example of the right way to use grant dollars,” said Anibal Ramos, Newark Councilman and Director of the Essex County Departments of Citizen Services and Economic Development, Training and Employment. “This really means a lot to the community and the children. Thank you to the County Executive and Freeholders for what you do,” Newark Councilman Luis Quintana said. “We want to express our gratitude to Joe DiVincenzo and the Freeholders for their continued support of our children and providing the best and safest facilities,” said Luis Lopez, founder of the Roberto Clemente Little League. “Such a wonderful job was done to upgrade this field and the entire complex, which now has five fields with synthetic grass,” said Gerard Marchese from the North Ward Little League. “This park has been transformed. Projects such as this are preparing our young children and projects such as this help develop their character,” Deputy Chief of Staff William Payne said. The Roberto Clemente Field is heavily utilized by youth recreation programs and high school teams. The original synthetic grass surface was installed in 2005 and needed to be replaced due to regular wear and tear. The baseball field will be modernized with a new synthetic grass surface and repairs to the fencing will be made where necessary. The improvements were designed in-house by the Essex Department of Public Works, which also monitored the project to ensure delays were avoided. Applied Landscape Technologies from Montville was awarded a publicly-bid contract for $674,000 to perform the construction work. It was funded with a grant from the Community Development Block Grant Program. Construction started in late November 2018 and was completed in four months. The Branch Brook Park Alliance has been the primary partner with Essex County to revitalize Branch Brook Park, which opened in 1895. More than $50 million of upgrades have been made throughout the Park through this partnership. Park enhancements have been supported with grants from corporations, the New Jersey Green Acres program, the Essex County Recreation and Open Space Trust Fund, philanthropic organizations and community members. In addition, the Alliance has sponsored a variety of programs to clean the waterways, spruce up the park, maintain the cherry tree collection, develop an urban farm, among other activities. Synthetic grass surfaces were installed on the Ray Dandridge and Jerome Greco Little League Fields in 2018. A bronze bust of Frederick Law Olmstead was dedicated in 2018 and a bronze bust of Mendelssohn was restored and rededicated in 2017; both are located in the Prudential Concert Grove. A playground designed with a cherry blossom theme was opened at the Essex County Cherry Blossom Welcome Center in 2015. The Barbara Bell Coleman Welcome Center and Concourse Hill upgrades, along with the opening of a two-mile, synthetic surface walking track, creation of a children’s garden at the Cherry Blossom Welcome Center, renovation of a well in the Park’s Northern Division, the rehabilitation of the Reservoir Walls in the Park’s Southern Division and modernization of the Clifton Avenue basketball courts were completed in 2014. The bronze statue honor the late tennis legend Althea Gibson was dedicated and the 20-court tennis complex named in her honor received a complete makeover in March 2012 and the field house in the tennis complex was renovated in July 2012. The Essex County Park System was created in 1895 and is the first county park system established in the United States. The Park System consists of more than 6,000 acres and has 23 parks, five reservations, an environmental center, a zoo, Treetop Adventure Course, ice skating rink, roller skating rink, three public golf courses, a miniature golf course, golf driving range, four off-leash dog facilities, a castle and the Presby Memorial Iris Gardens. Branch Brook Park was created in 1895 and is the first park in Essex County’s system. At 359.72 acres, it is the largest county park in Essex.